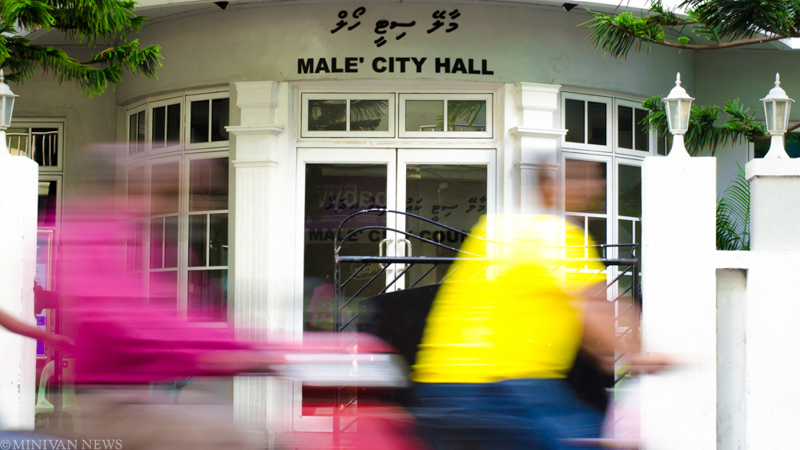 The housing ministry has pedestrianized two narrow lanes in the capital Malé city. The Embu goalhi and Gul’alaa goalhi in central Machangoalhi ward were closed to traffic as part of a campaign to make Malé city friendlier to pedestrians. The housing ministry has also barred vehicles from parking in the lanes. Malé is one of the most congested cities in the world. The housing ministry in February pedestrianized two lanes, the Heenaa Goalhi and the Raivilla Magu. However, they were opened up for traffic within days after residents in the area complained. A Chinese team of scientists is conducting a seismic survey of the ocean basin between capital Malé and the airport island for a planned bridge. Housing minister Dr Mohamed Muizzu last week said the bridge will run from Malé’s surf point, Raalhugandu, to the southwest corner of Hulhulé island’s airport runway. The Chinese team is to drill 29 boreholes, 59 meters deep, in the ocean basin to see if it can hold the bridge’s foundation pillars. Designs for the six-lane bridge is expected to be completed by the end of June this year, the government has announced. China has previously said it would ‘favorably consider financing’ the bridge if the design proves feasible, while President Xi Jinping said he hoped the government would call the bridge “the China-Maldives friendship bridge”. It is expected to cost between US$100million to US$150million. Construction of the Malé–Hulhulé Bridge, first slated to begin in 2014, will now start by the end of this year, and will be completed within two years. The bridge, a key campaign pledge of President Abdulla Yameen, will also connect Malé to its suburb Hulhumalé, an artificial island located behind Hulhulé and connected by a short causeway. The housing ministry has said its staff have been feeding pigeons at three designated locations in Malé after a ban on feeding pigeons at the republic square sparked public outrage. The ministry posted pictures on its Facebook page today of staff feeding pigeons at the artificial beach, the tsunami monument area, and a park near the southwestern harbour. Executive coordinator Abdulla Shahid told the state broadcaster that the ministry imposed as a temporary measure while renovation work, including repairing a water fountain and replanting grass, was ongoing at the square. The government is renovating public spaces in the capital in preparation for the upcoming golden jubilee of independence on July 26. The ban drew strong criticism on social media after numerous pigeons died of apparent starvation. Hundreds of children and adults gather at the square in late afternoons to feed raw rice to the pigeons. The President’s Office has said students will continue to use the Jamaaludheen building until June in order to protect the interests of the students. In a tweet posted last night, President’s Office spokesperson Ibrahim Muaz said that President Abdulla Yameen had decided to extend the deadline given to vacate the building used by the Maldives National University (MNU). Muaz announcement came just hours after the Ministry of Housing and Infrastructure announced that the building was structurally unsafe, explaining the government’s previous request that police vacate the premises. The decision had prompted concern from the university, the student union, and the opposition Maldivian Democratic Party (MDP), who suggested that the lack of an alternative building would disrupt students’ education. Muaz told Minivan News today that there are no contradictions in the matter, as the government still believes that the building is unsafe even though the deadline has been extended. Housing minster Dr Mohamed Muizzu yesterday shared pictures from an assessment of the building done in 2013 with the media, showing severely corroded and damaged columns in the building, which is currently used by over 1,300 university students. “Cosmetic work has been done in the building to cover up these damages,” he said. After ministers yesterday said the university had been unresponsive to offers of alternative teaching space, the President’s Office said today that the university would be given no more chances regarding the matter. Deputy Vice-Chancellor of MNU and former Permanent Secretary of Housing Ministry Dr Mohamed Shareef had said that the university has been informed of the president’s decision and is looking into alternatives for after the deadline. Dr Shareef refuted the government’s claims that the university has been provided with alternatives to vacate the premises. “The government spoke about land in Hulhumalé and Gulhifalhu. However, these plans were very vague and not written down on paper,” he said. The deputy vice -chancellor also said that the university is trying to get an independent third party to do a risk assessment of the building to determine the safety of the students. Malé City Council (MCC) has alleged that police officers and some housing ministry staff are impersonating city council supervisors and unlawfully trying to confiscate items at the local market. According to an MCC press statement released today (February 8), the local market falls under the jurisdiction of the city council as part of the Decentralisation Act. However, the council said it had been receiving complaints from market traders saying that police and housing ministry staff are pretending to be council supervisors and attempting to confiscate items. Repeated removals of the council’s powers by central authorities has led to suggestions that the government is trying to “destroy decentralisation”. The removal of lands formerly under the council’s jurisdiction in December last year saw the city mayor admit that his council now oversaw only construction, issuing death and birth certificates, and cleaning mosques. Later the same month, the housing ministry transferred over one third of the council’s employees to its own offices. The council today condemned the acts of the officials accused, saying that this activity was being carried out without consulting the council in order to defame it. The housing ministry has taken control of 13 plots of land belonging to the opposition dominated Malé City Council, and transferred the majority of the council’s public services division staff to the ministry. According to a housing ministry announcement, all of Malé City’s streets, the Artificial Beach area, Plot 211, Usfasgandu, the T-Jetty area, Dharubaaruge Convention Center, Sultan Park, Maafannu round-about, Adi Park, Alimas Carnival, Fishermen’s Park and all other parks now belong to the ministry. Any individual wishing to make use of these lands must now seek permits from the ministry. The State Electric Company (STELCO) and Maldives Police Services would not provide services for any events unless a housing ministry permit is obtained, the announcement said. The move continues a steady removal of powers from the council, in what has been characterised by its officials as an attempt to destroy decentralisation in the country. Malé City Mayor Mohamed Shihab has condemned the government’s systematic abrogation of the council’s powers and said it constituted a breach of the powers afforded to the council under the Constitution and the Decentralisation Act. “We are now only in charge of facilitating construction in Malé, issuing death and birth certificates and cleaning mosques. But the constitution clearly states the Maldives must be administered through decentralised councils,” he said. The government must respect Maldivian laws to attain development, he contended. “The powerful are now abusing their powers in the Maldives. This is very sad. Ultimately, it is the ordinary Maldivian citizen who will suffer the most. Investors will not invest here. No one knows what will happen tomorrow or the day after. We have to uphold the law if we want to develop at the same levels as developing countries,” he said. Deputy Mayor Shifa Mohamed said the council has challenged the transfer of council staff to the housing ministry at the Civil Court. In addition to transferring council staff, the ministry had also illegally taken over the council’s assets, including dustbins and trees for a greening programme, in the public services section, she said. Shifa has described the government’s actions as a plot “to destroy decentralization”. 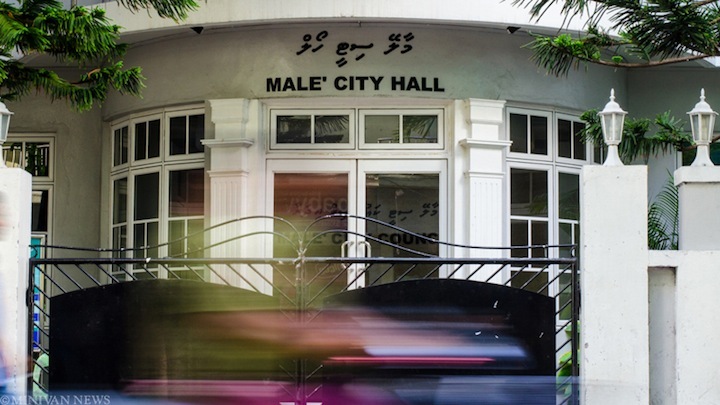 On November 26, the council declared it was close to shut-down after the Maldives Police Services confiscated documents and computer systems at the Malé City Council offices under a court warrant on allegations of corruption. The survey authority and the land registration project fall under the authority of the Ministry of Housing and Infrastructure. The council has denied receiving such files, stating that any surveys on Malé lands would have originated from the council. The cabinet in early November announced it had removed the council’s jurisdiction over the city’s roads after disagreements over the replanting of vandalised trees. Opposition leader and former President Mohamed Nasheed has said the trees were uprooted by masked policemen. Police have dismissed the claims. Local media have since reported that the ruling Progressive Party of the Maldives believes the trees were being used to curse President Abdulla Yameen. The roads are now under the control of the housing ministry and the Maldives Road Development Corporation (MRDC) which has started cleaning the drains, bringing some alleviation to persistent flooding. The government had suggested that the council had failed to adequately maintain both Dharubaaruge Convention Center and the roads of the capital, though the council has maintained that state funds allocated for the work was not released by the finance ministry. The government in October also scrapped an agreement made with India–based Tatva Global Renewable Energy to provide waste management services in the capital Malé and nearby areas.